Toyota reentered the rear-wheel drive sports car game with the 86 (née Scion FR-S) back in 2012, and now it’s got something bigger in the works. Something that could be a successor to the mighty Supra, one of Toyota’s most beloved cars of all time. There’s a lot we know about this car and there’s a lot we’ve heard, so we’re compiling all of it here, just for you. According to Japan’s Best Car magazine, the Supra could make its debut as a concept car at the Tokyo Motor Show in October. Apparently, it’ll share the stage with a version of the little, rear-drive S-FR Concept first shown at Tokyo in 2015, and intriguingly, some sort of sporty Corolla concept. Three Toyota performance concepts at one auto show sounds unusual, but company CEO Akio Toyoda is committed to bringing more sporty, exciting cars to market. We’ve already seen that with the bewitching Lexus LC500 coupe and the WRC-inspired Yaris GRMN hot hatch, and apparently there’s much more to come. In any case, we’ll find out what Toyota has in store very soon. The Supra will be the result of a BMW-Toyota collaboration first announced in 2012. The two companies are working together on engines and lithium-ion batteries, and most interestingly, a new rear-wheel drive platform. We’ve already seen the concept form of another car set to ride on this platform—the next BMW Z4 roadster, which debuted at Pebble Beach this summer and promises to be a legitimately excellent sports car. BMW is reportedly targeting a sub-3200-lb curb weight for the Z4, which is good news for the Supra said to share its platform. We think the Supra might be available as a hardtop only, since we haven’t seen spy shots of any soft-top prototypes testing, so it’s possible the Supra might be even lighter. There’s been no lack of videos showing the Supra in testing at Germany’s famous Nürburgring. This is the proving ground of choice for high-performance products, and an indication that Toyota really wants the Supra to be a true driver’s car. 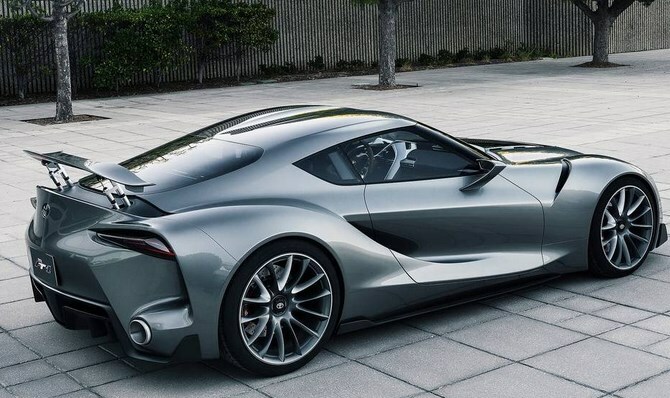 In May, we reported that the Supra would hit production next year, and that it would be assembled in Austria by contract manufacturer Magna Steyr, which is best known as the company that builds the Mercedes-Benz G-Wagen. Based on Nürburgring videos of Supra prototypes, we’re thinking they’re running some sort of six-cylinder engine. We’ve heard that the model could get a V6 augmented by an electric motor, or perhaps a BMW straight-six. This probably won’t be the only drivetrain available, for reasons we’ll get to below.